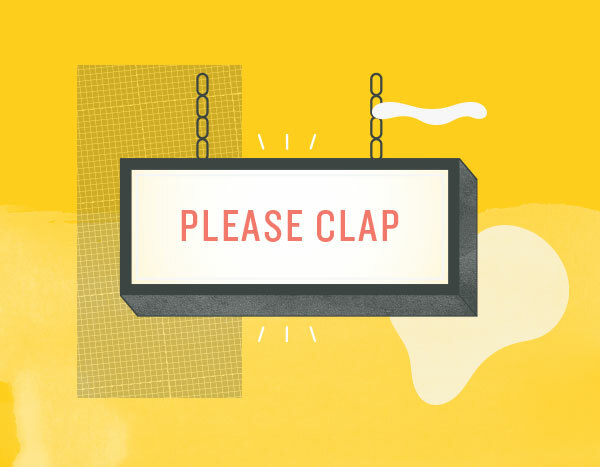 Creating a good onboarding experience is no longer a nice-to-have, it’s a necessity. The impact of onboarding is felt in terms of years, not weeks, and by teams, not just individuals. 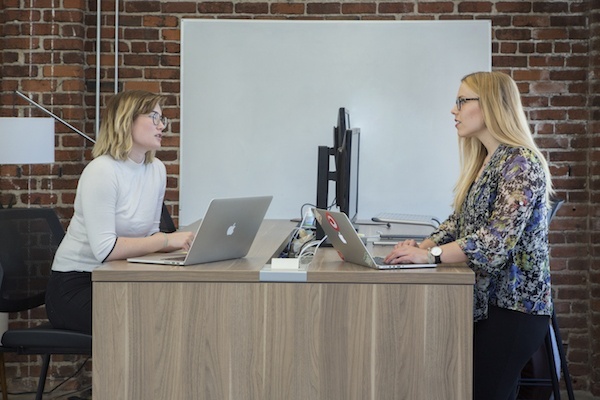 A good onboarding experience means people become productive sooner and stay longer, the benefit of which is felt by the individual, their team, and the company. However, the creation and implementation of a great onboarding experience isn’t easy. The question remains: how do you create a great onboarding program? Since I started with Culture Amp in June 2015, we have grown from 30 Campers (this is what we call new hires, an abbreviation of Culture-Ampers) to over 160, with plans for continued growth. Throughout this time, I have used our platform to collect feedback from new Campers on what worked and what didn’t in their onboarding experience. After growing our onboarding experience over the past two years, I’m sharing what I considered in developing the experience, what I learned along the way, and what the program looks like now, including the tools I have in place. There are many ways to create an onboarding program, and by sharing my process, I hope you gain insight on one way to get started. Before we get to the details, I want to share three things that I have found important in creating and evolving an onboarding program. Don’t be afraid to break it down and start from scratch. You might find there are pieces of your current program that don’t work well, but you keep iterating to make them work. If you take the time to step back from it, you may find there is a bigger issue. Maybe it’s simply not meeting your needs or it doesn’t work for where you are as a company anymore. Don’t be afraid to take a fresh look at something and ask what purpose it is serving, if any. Onboarding is a team sport. The buy-in and support of managers, team members, and other people who are involved with your new hire’s day-to-day experience matter. A unified onboarding team will make a world of difference in being able to pull off the experience you want to deliver. 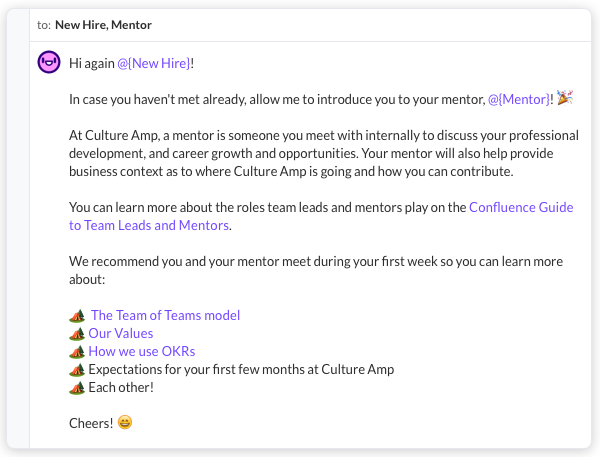 At Culture Amp, we have a number of formal roles that participate in onboarding a new Camper: Camp Guide, onboarding coordinator, team lead, mentor, orientation leader, IT, and people operations. Enabling other people to participate in the process and take a bigger role in onboarding makes for a more enriched and overall more scalable onboarding process. You need to assess the resources you have - both in terms of money and people’s time, as well as clearly laying out your challenges. One of our biggest challenges has been implementing a program that scales globally for our offices in London, Melbourne, New York and San Francisco. The scope of the program has evolved over time as we have grown and have the capacity to have more people involved in being a part of a new Camper’s experience. Throughout the iterations of our onboarding program, we always used our platform to survey new hires about their onboarding experiences. Between the survey and the one-on-one meetings I had with nearly every new hire, I was able to iterate a lot over time. Some of these things would be small (like broken links in a checklist) and some would be feedback about things they thought were fundamentally broken. Getting this feedback was essential in being able to evolve the program. Here’s what I learned, which may be helpful in setting up your onboarding program. What do you want the new hire to do in the first weeks? What do you expect them to accomplish within the first few months? Do you want them to spend time solely on onboarding tasks or do you want them to dive into their role immediately? Providing this guidance to the new hire helps to remove any guesswork for them about what they should be focusing on during their onboarding. When a bunch of information is thrown at people all at once, it can be hard for them to discern if certain pieces of information are more important or more actionable than others. Help them prioritize what they need to know and do first, and what can wait. People learn in different ways and at different paces. Try to allow for this flexibility and provide content in a variety of ways. Some people will learn best through reading, others will prefer an orientation session or conversation, and others will want to do something more hands on. When someone starts a new job, they are learning names, norms, roles, culture, and more. It is extremely likely this will be overwhelming. Try to build in some down time so people can breathe and taken in what they have experienced. Understand that a lot of what people hear in the first few weeks will not actually be absorbed, and provide time for them to learn over time. Collecting feedback through our onboarding survey is something that evolves as we do, and it helps me to continue iterating on our program. You might find similar experiences in surveying your own team, or they might have different feedback. Take the time to listen to what new hires have to say, and use that to improve your program. I found myself in front of a large wall with a variety of color sticky notes and armed with months’ worth of feedback. I put everything we had in place on the wall and started moving the notes around. I determined an objective for each week in the onboarding process and that guided which sticky notes belonged where. First, there were the logistical pieces that just had to happen - paperwork, accounts, etc. Second, there were all the things people do to acclimate to a new place - finding their way around, learning the norms, meeting people. At the same time, new hires are learning about the company’s mission, vision, values, and beginning to learn the knowledge, skills, systems, and expectations of their roles. The first couple of weeks became focused on checking the logistical boxes, which we try to keep as lean and pain-free as possible. This early period also includes spending time to learn about who we are and what we believe as a company. Weeks three and four delve more into role-specific experiences, including learning how their team works together and getting in-depth training on systems and processes. Weeks five and six circle back on the learnings of the first two weeks, which can easily be forgotten given how overwhelming the first weeks at a new place can be, as well as continue to build and expand on the role-specific knowledge of weeks three and four. These sessions (which take place in person or over video chat) cover our culture, values, product and positioning, customer journey, information security, and people operations. These sessions provide information about who we are as a company, how we operate, why we have the values we do, how they guide our product and what we deliver to our customers, and our benefits. Greenhouse Onboarding and Donut are our two main tools for onboarding. The Greenhouse Onboarding platform provides an introductory welcome experience that shows new hires information, including pictures and videos, about their office, their team, and a directory, as well as introductory content about Culture Amp. It also provides structured checklists that we are able to assign based on location and role. We ask new hires to fill out some information about themselves, including a general “about me” section, hobbies, past work life, and “talk to me about.” The profile information (complete with their photo) gets sent out to the company automatically at the beginning of their first week. We also use a friendly Slack bot named Donut to help deliver important reminders and introductions to key team members like team leads, mentors, and Camp Guides. In these messages, I include guidance and resources for conversations between team members, and other relevant content like product videos for new hires to watch. The Camp Guide is someone outside of a new Camper's team who will help a new Camper during their first weeks. The Camp Guide will be a key link in the new Camper's experience - providing support in helping them learn the ins and outs of Culture Amp and develop relationships across the company. The Camp Guide helps the new Camper to learn the things that are unique to our culture, meet people, and get settled in. Kealan Harman, an Account Executive in our San Francisco office, is a recent new Camper and now Camp Guide. Kealan said he loved having a Camp Guide and happily volunteered to be one himself. He said his goal is to be one link in a long string of Camp Guides and thus create a Camp Guide family. Even with all the progress I have made on our onboarding program so far, I already have visions of future iterations. The systems and processes that best fit us now will evolve as we grow. The challenges we face will also continue to expand. Relying solely on a People Team to deliver the onboarding experience can be difficult for lean teams scaling a company quickly. 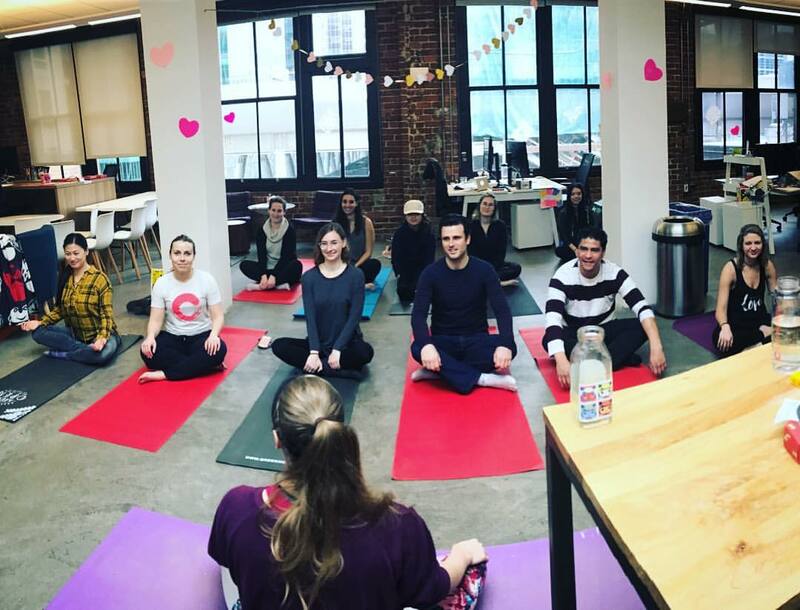 When a company is dispersed across the globe, involving people outside of the HR/People Team in onboarding new hires capitalizes on shared expertise across roles. A team member or manager is in a unique position to share how their team works together, and perhaps deliver product-specific knowledge. In future iterations of our program, I envision expanding our onboarding team to include people who could develop more content and in-depth training sessions targeted to specific roles. Something core to our culture is storytelling, so I also envision moving toward more guided onboarding journeys. 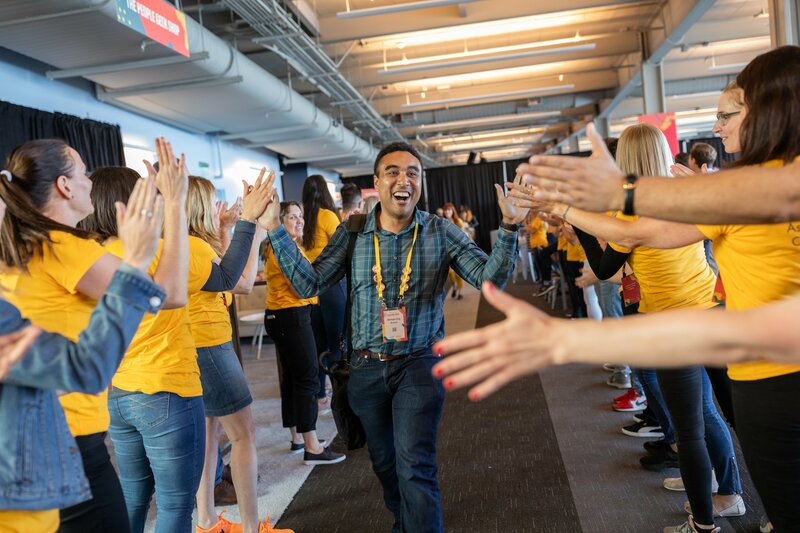 Imagine if onboarding was a bit more like the hero’s journey narrative - the new hire meets interesting people along the way, shares a bit of themself, and accomplishes something that makes them feel victorious. Wherever you are on your journey towards creating a great onboarding program, don’t be afraid to start from scratch, create your team, gather your resources and continue iterating. 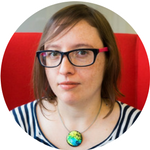 Stacey Nordwall is a People Geek and Senior People Operations Manager at Culture Amp. She has an MA with Honors in Counseling Psychology from St. Mary’s College of California and a BA in Psychology and Communication from Stanford University. She is passionate about learning how and why people think and behave as they do, helping people grow, and working to improve the world of work. Stacey has scaled Culture Amp's onboarding program through 5x growth, and is responsible for Culture Amp's people operations globally. You can connect with Stacey on LinkedIn.